With Easter just around the corner Slots Heaven casino has launched an Easter Egg Hunt promotion with different bonuses to enjoy every single day until 27th March. For instance today you can enjoy 10% cashback up to £500 on all losses, on Tuesday you can enjoy double the loyalty points by playing Easter Surprise, on Wednesday you can claim a £5 bonus, on Thursday you can get a 100% deposit bonus of up to £200, on Friday another bonus of up to £80, on Saturday a 20% bonus of up to £500 and on Sunday a 50% bonus up to a massive £1,000. 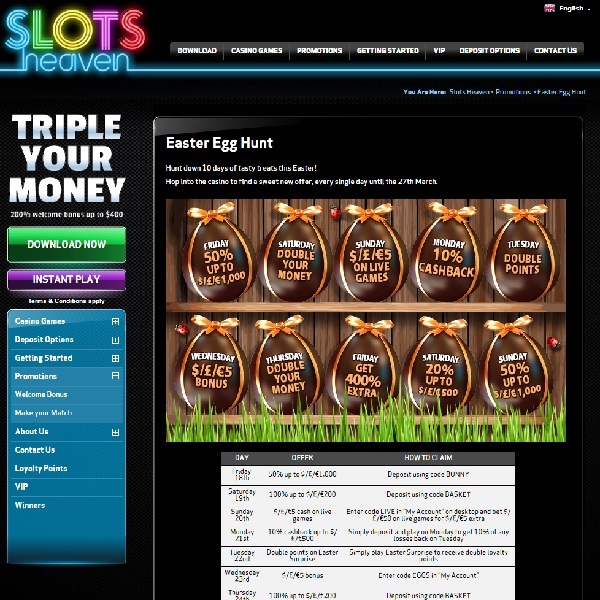 Make sure not to miss out on this great opportunity, head over to Slots Heaven today to find more details on how to claim each of these amazing bonuses and make it an Easter to remember.